Managing invasive plant species is often the greatest challenge faced by land managers. Because there are so many invasives and so little time, it’s critically important to be thoughtful about how to approach them. There is much good advice available about how to prioritize which species to focus on and how to approach those priority species. My own approach to invasives continues to change over time. For what it’s worth, here’s how I think (today) about categorizing invasive plants on our sites here in Nebraska. I can put most invasive plant species into one of four categories that describe how we approach control. Category 1 – Thin the matrix. Essentially, we try to use fire, grazing, and/or mowing to weaken invasive grass plants and open up space between them for other species to flourish. Because these suppression strategies also have negative impacts on some native species, we are careful not to use them too many years in a row. Instead, we apply them periodically, whenever it looks like the invasives are starting to exert their dominance a little too much. 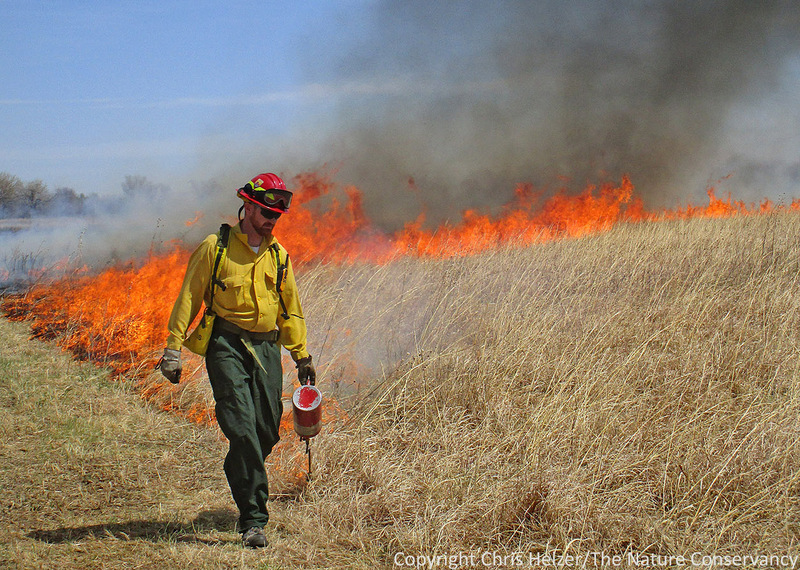 Prescribed fire and grazing are the two best ways we attack invasive grasses such as smooth brome and Kentucky bluegrass. Category 2. Beat them back. An exception to the “work from the outside edge first” rule applies to species such as Siberian elms that may be spreading from a single discrete patch of parent trees. If it’s possible to eliminate that source population by cutting down a handful of trees, it absolutely makes sense to do that first. Next, it’s smart to target other elms that are big enough to produce seed before working on the smaller ones – rather than blindly following the rule about working from the edges of an infestation. Rules are meant to be broken, after all. Category 3. Nip them in the bud. This category contains invasive species that are just starting to show up in our area or at a particular site. Here, the tactic is to seek and destroy new plants as soon as they arrive, to prevent the species from becoming established. After all, it’s always better to attack an invasive species before it gains a foothold. Many species can fit within this group. For us, Common reed (Phragmites australis), crown vetch, garlic mustard, and Queen Anne’s Lace (aka wild carrot) are good examples. Sometimes, we’re not sure if a species will really cause serious problems if it becomes established at our sites (e.g., Queen Anne’s Lace) but if minimal effort can prevent that establishment, it seems like time well spent. Our approach to musk thistle sort of fits into this “nip it in the bud” category, but for other reasons. 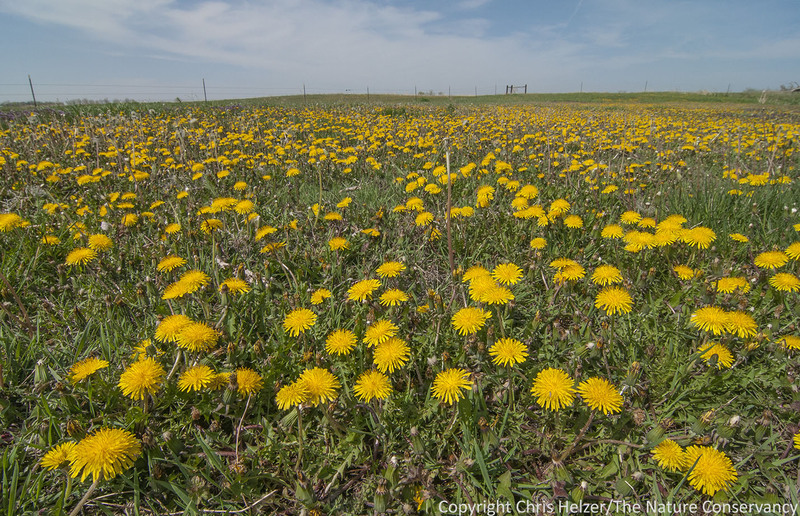 Musk thistle is an officially-designated noxious weed in Nebraska, and all landowners (including us) are required to eradicate it from their property each year. If it weren’t for the state law, musk thistle would not be among our highest priority species because it really doesn’t cause big problems in most cases (on our sites). It is most abundant where the dominant vegetation has been recently weakened by fire, grazing, or drought, but quickly diminishes in abundance when grasses recover their dominance. However, to abide by the law and to prevent thistles on our land from going to seed and affecting our neighbors, we do our best each year to eradicate musk thistle. Tier 4. Live with them. This last group includes species we don’t actually consider to be invasives, at least by the criteria that a truly invasive plant acts to reduce biological diversity or otherwise simplify (and thus weaken) natural communities. Many native species are considered weeds by some of our neighbors, but we like having them around. Prime examples include annual sunflower and ragweed species. However, many non-native plants fall within this category as well, including common mullein, dandelions, goatsbeard, marestail, and sweet clover. Sometimes, we spend some time collecting and/or analyzing data to help ensure that we’re categorizing these species correctly. A good example of that was discussed in an earlier post on sweet clover. Dandelions are a species we just live with. They’re great for early season pollinators, and aren’t aggressive – they just fill space when the perennial plant community is weakened (as they are doing here in the lot around our shop buildings). Ideally, of course, we’d be able to move some invasive plant species from one category to another, so that populations of “matrix” invasives shrink to the point they are in discrete patches and we can “beat them back.” Likewise, it’d be great if “beat them back” invasives became rare enough that we could eventually “nip them in the bud”. Unfortunately, reality usually goes the other direction. For example, we’re dangerously close to having to shift garlic mustard from “nip it in the bud” into the “beat them back” category (if not the “thin the matrix” category!) at a nice woodland site we manage. We’ll see what the next year or two brings. 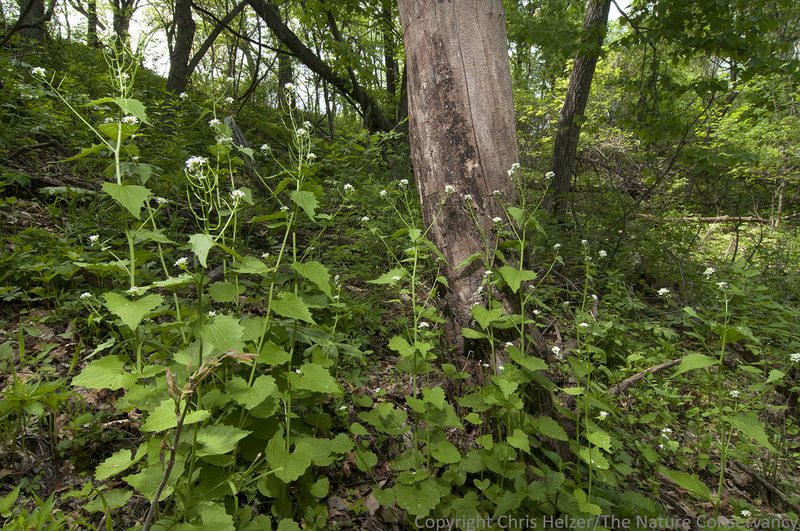 We hope that using more frequent fire (along with other methods) will help us prevent garlic mustard from spreading across our whole property at the Rulo Bluffs Preserve, but it’s a big challenge. Regardless, I find it helpful to think about our invasive plants within categories like these because we can more easily define both our control strategies and objectives. Putting a species into the “nip it in the bud” category helps make it a top priority and we can prioritize resources toward keeping it rare. Just as importantly, if we know that we’re only trying to suppress the dominance of smooth brome, not eradicate it, we don’t have to beat our heads against the wall in frustration because smooth brome is still present. We spend more time on invasive plant control than on any other land management activity. Unfortunately, that’s true of most land managers I know. More unfortunately, invasive species numbers are going up, not down. It’s not time to throw in the towel just yet, but it is absolutely critical to be organized and thoughtful about how we approach these invaders. Hopefully, being organized will allow us to spend less time on invasives and more time enjoying the sites we manage!